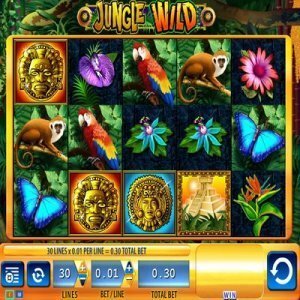 [miau] Released in September of 2011, Jungle Wild is a non-progressive, 5 reel video slot game with 30 pay lines, a low minimum bet, and fun and fabulous features. Minimum bets are just 0.01 a line and the payout is potentially $7,500 in cash. The catch is that you need to be playing with all 30 pay lines enabled to win the grand prize, which is still only $0.30 per spin. The FREE SPIN feature is a main attraction of this game. You can get up to 20 FREE spins and for every FREE SPIN, there will be 2 reels that will randomly become WILD which increases your chances of winning. The FREE SPIN is triggered when three (or more) template symbols (represented as scattered ancient pyramids) show up on the reels. Three symbols will get you FIVE free spins, four symbols and you get SEVEN free spins and when you are lucky enough to get five symbols, then you hit for 20 FREE SPINS. If during the FREE spin process, you hit another three symbols, you will get FIVE more free spins. This spinning streak feature is exciting and it offers a higher potential to hit big. Thanks to the innovation of the BONUS GUARANTEE feature, you are guaranteed to win a certain amount when the free spin feature kicks in. This feature of Jungle Wild slots will kick in if you win less than 10x your stake in this feature, when all pay lines are activated. A Mystery Kicker will be applied if you play less than the 30 pay lines and this feature can reward you 2, 5 and even 10x your initial investment. This G+ bonus guarantee feature means that you will win in the FREE SPIN feature, no matter what happens. AUTO PLAY is another feature of Jungle Wild slots and you can choose between two types of betting panels. The difference between the Quickbet and the Classic betting panels is that the Quickbet feature allows you to make quick wager changes. Cash outs are available within 24 hours, and many times within 12 hours and payment methods include debit/credit cards as well as PayPal. United Kingdom players are welcomed. This game is set among the lost civilization of the jungle that has a Mayan theme and hidden treasures in addition to vibrancy that you will find in the real jungle. The animal and flowered symbols, which are shades of pink, blue, orange, gold and purple, are set in front of a bright green colored backdrop. Enter into the JUNGLE and bring this exciting Las Vegas slot game into the comforts of your home. Take a trek into a wild jungle atmosphere and spin your way through adventure and bonuses that can lead you directly to treasures and big winnings. Jungle Wild is an online game that is a favorite among slot lovers, so take a journey into the jungle and gather the riches that are available while playing this fun and engaging online slot game. The WILD symbols, FREE SPINS, extra bonus features and large jackpot make Jungle Wild a game worth playing. Give Jungle Wild a try today.